Before seeing the film, I was lucky enough to hear a radio interview with Writer/Director Neil Blomkamp. He described how he wanted to combine his love of Sci-Fi with the experience of growing up in a "crazy" place like South Africa. In that regard, I'd have to say, mission accomplished. It's incredible what Blomkamp was able to accomplish with a modest budget, under 40 million dollars. Okay, we're not exactly talking about a shoe-string production with Grandma doubling as cinematographer and chief stunt woman, but for the scope of the film, the final result is still pretty impressive. I'm not gonna name names, but a couple of the effects exceeded the work seen in a recent summer blockbuster or two *cough* G.I. Joe *cough*. Stuff gets blown up real good with lots of cool alien weaponry as our "hero" fights to regain his humanity -- it's highly debatable how much he had in the first place. While entertaining, I didn't think the film had some deep, resonating message. "Alien Nation" already covered the oppressed-minorities-substituted-with-aliens-thing. Here, I don't think the aliens are supposed to represent anything but aliens -- who get high off cat food. 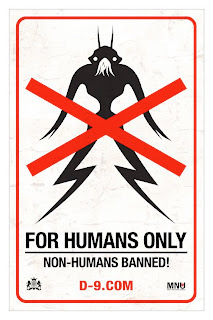 There's a good bit of satire in the beginning, but aside from saying that earthlings of all colors are scum, "District 9" settles into your basic Sci-Fi actioner worthy of rabid fanboy adoration. Now it's more than possible that my American eyes didn't pick up on all the nuances, but I think I got the gist of it. I don't foresee a Best Picture nomination in its future, although anything is possible with ten open slots, but one for visual effects certainly wouldn't surprise me. So glad I didn’t see this in theaters. Better action than the first installment, but a weaker story and a little too dark for my taste -- I mean literally too dark, there were times where I couldn’t see who was killing what. I have give “Transformers” credit, because it did a superior job of weaving humans into a story about battling aliens. Seriously. They’re mostly fodder here, zero character development. If you could mash up the first and second film, this could have been a fun ride. Another thing missing from the “A vs. P” films is the psychological battle, people revealing their true selves and motivations. Sure, there was action and gore in the now classic films, but there was also a lot of back stabbing, cowardice and devious plotting going on too. Instead, we’re stuck with lame stock characters and their boring lives. You’re practically rooting for them to be killed the minute they’re introduced. Lots of winks and nods to the franchises ain’t enough to pull of an entertaining film. The unproduced, futuristic script of “Aliens vs. Predator” was a much better concept -- and probably too costly to pull off. After sitting on the shelf for quite some time, "Outlander" is finally getting a limited release in the States -- surprising when you consider that the budget is close to 50 million dollars and the cast includes some recognizable names. Badass Vikings battling an alien creature. Plus, it's rated R! You would think the marketing folks wouldn't have had a hard time selling this one. Came across an insightful article on how the idea/script was developed. Eighteen years in the making? Talk about perseverance. You’re both talented and accomplished actors, but please stop making movies together. You're like some bizarro Wonder Twins couple, canceling each other out. I gave you a pass after the average “Golden Compass”, but this stinker is just plain indefensible. “The Invasion” makes Lindsay Lohan’s “I Know Who Killed Me” look like “Silence of the Lambs”. You've moved on to bigger and better projects, but if you ever get the inkling to hook up on screen again... don't! Okay, so I’m being a bit facetious, but it’s still an awful movie. How do you screw up a concept that’s been done a million times over? Maybe that’s the problem. A Hail Mary pass to be bold and daring, instead turns into a flat, uninteresting film. And don’t get me started on that ending. I honestly expected the “real” ending to pop up after the closing credits.